Eric Pickles has come under fire for telling an alleged abuse victim to "adjust your medication" when she accused him of failing to help her. Teresa Cooper is one of a number of women who say they were heavily sedated in a care home as teenagers and went on to have children with birth defects. She confronted the communities secretary at an event in Essex claiming he had "ignored" her case. Mr Pickles retaliated by telling her she had given "different stories". He then told her to "adjust your medication". His comments came to light in The Independent, which published an audio clip of the exchange on its website. 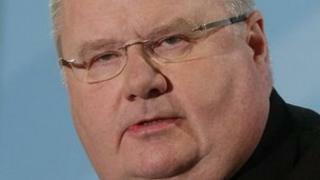 A source close to Pickles said: "He was giving her a frank piece of advice in private. It wasn't meant in any way to offend or insult her." An investigation by BBC Radio 4's Today programme in 2009 claimed that teenagers at the Kendall House home in Gravesend were restrained with huge doses of tranquillisers and other drugs. It said 10 girls who were heavily sedated while living at the care home during the 1970s and 1980s went on to have children with a range of birth defects. Ms Cooper, who left the home in 1984 at 16, was said to have been given medication at least 1,248 times over a 32-month period. Shadow communities secretary Hilary Benn, for Labour, said: "What Eric Pickles said was thoughtless, stigmatising, very hurtful and he had no option but to apologise. "David Cameron should make clear that this sort of out-of-touch comment should have no place in modern Britain." Marjorie Wallace, chief executive officer of mental health charity Sane, also criticised the communities' secretary's comments. She said: "Even if they were taken out of context, they could be seen as thoughtless and hurtful, and such personal comment should never be made." But the mental health campaigner said David Cameron need not have worried about describing Ed Miliband's policy on corporation tax as "nuts". The prime minister used the term in a Sunday Telegraph interview. He repeated it on Andrew Marr's programme on Sunday morning, before checking himself saying he did not want to get into a "huge argument with the mental health lobby". Mrs Wallace said she was not concerned, as Cameron was referring to a policy rather than a person. She said: "You can go too far down the politically-correct route and make it impossible for anyone to say anything without fear of taking offence. "This treading on egg shells doesn't help reduce stigma and can even increase it making mental health a no-go area, leaving those who suffer more isolated." Another charity - Mind - said they were aware of the prime minister's interview but would not comment as Mr Cameron was not talking about the mental health of another person. At Labour's conference last week, Mr Miliband pledged to reverse a planned cut in corporation tax.